Wow a Couple of Minutes of Free Time, and here two lines of code example to answer at Dave's question "How to Draw iPhone Like Notification Badges". Badges are used olso in Mac OS X in application like iTunes and in the DockBar, check this post "Cocoa Notification Badge" to see how to use it with cocoa. 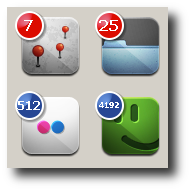 Obviously Notification Badges will be a features of My OpenMoko Apps. The Source Code is Available here: Qt Draw Badges Source Code.